Jimmy Buffett’s song, “The Everlasting Moon” is a favorite of mine, appealing to my inner lunacy. The moon does seem everlasting yet another luna, the ephemeral Luna Moth, lives for only one week – to be beautiful, mate, then die. Though not rare, they fly only at night in forested areas. Actias Luna, in the Giant Silkworm Moth family, is lime green in color and can be 4.5 inches across. I have only seen two in my life, both during full moons of summer. 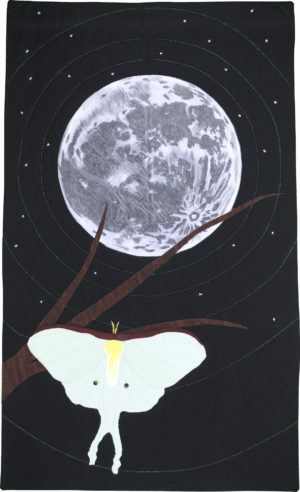 There are some cultures that believe the Luna Moth is a symbol of an intuitive insightful soul. Perhaps instead, it is the lucky soul who has the patience to seek nighttime treasures, gaze at the full moon, and observe the illusive and the ephemeral by the glow of that everlasting moon. Painted fabric, layered netting, beading. Quilting cottons, Ultrasuede, netting, beading, various quilting threads.